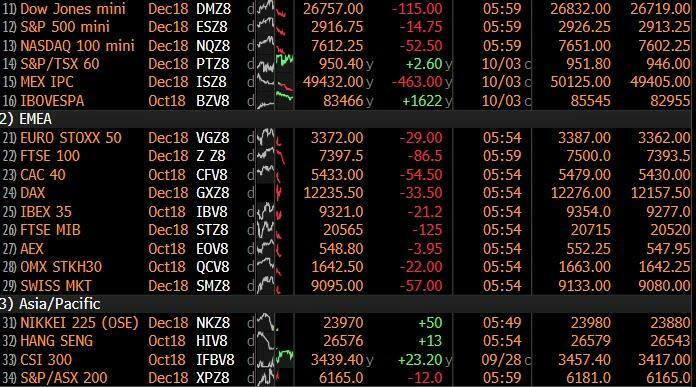 A sea of red has greeted stock traders across the world this morning after what one analyst called “monster moves” in U.S. Treasury yields. The bond rout that sent 10Y Treasury yields to the highest since May 2011 promoted by stronger than expected US economic data, and which accelerated after upbeat, hawkish comments from Fed Chair Jerome Powell after the close, spread into Asia and Europe on Thursday, spurring more gains for the dollar and triggering widespread declines in equities. The catalyst for the selloff was the stronger than expected ADP private payrolls print and the near record print in the Services ISM survey which showed activity at its strongest since August 1997, sparking speculation the payrolls report on Friday could also surprise, with some suggesting a print as high as 500,000 was possible. 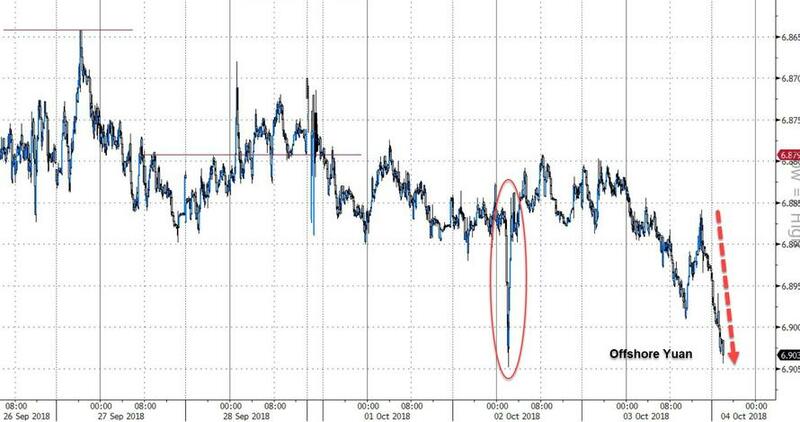 Subsequent comments from Powell who said the economic outlook was “remarkably positive” and that rates might rise above “neutral” helped the 10Y yield climb to 3.18% on Wednesday. U.S. jobs data on Friday may stoke boosting expectations for rate hikes into 2019, with the jobless rate seen dropping to 3.8 percent, matching the lowest since 1969. "Fixed income is the center of the financial world, and it’s hard to have a conversation without talking about the monster moves we saw in yesterday’s U.S. trade," said Chris Weston head of research at Pepperstone Group. "It’s a very rare occurrence to see U.S. Treasuries undergo such a huge move." The selloff in 10Y Treasuries, which caught traders by surprise with both its velocity and magnitude, continued overnight on Thursday sending the yield on 10Y TSYs as high as 3.2325%, the steepest daily increase since the shock outcome of the U.S. presidential election in November 2016, before fading to catch its breath amid massive trading volumes. "The trigger was Powell’s remarks on interest rates,” said Lee of Daishin Securities. "This spurred the view the Fed could turn more aggressive when it comes to the extent of hikes or the pace of tightening. Another issue is the possibility of the conflict between the U.S. and China developing into something beyond tariffs, involving the military." The sharp steepening in the Treasury curve, and the continued climb in yields spread like wildfire across the globe, pushing European and Asian yields higher while shares in emerging markets slipped. As noted last night, 10-year Japanese bond yields climbed past 0.15%, toward the upper end of the Bank of Japan’s tolerance zone of plus or minus 0.2 percent, rising above the 0.145% level which prompted intervention by the BOJ back on August 2. That said, MNI reported that the BOJ still stand ready to curb higher yields through bond buying ops if the rise is deemed too rapid. For now, however, Kuroda appears happy with the steepening in the curve which will boost local bank profitability. Euro zone bond yields rose sharply, tracking their U.S. counterpart, while the “trans-Atlantic spread” between United States and German 10-year bond yields hit a three-decade high of around 275 bps. German 10-year bond yields hit a 4-1/2 month high of 0.55% before settling at around 0.53 percent, still up six basis points on the day. “If the Fed is to hike rates beyond the neutral level, the underlying case is that the economy is doing very well - and if the U.S. economy is doing very well, that has spillover effects the euro zone,” said DZ Bank analyst Rene Albrecht. "This will make it easier for the ECB to raise rates in 2019; and you will see this impact yields in the euro zone, especially at the long end." The surge in the world’s "risk-free" rates trimmed investor appetite for other assets, and S&P futures dropped alongside the Stoxx Europe 600 and MSCI Asia Pacific gauges. The MSCI Asia-Pacific index ex-Japan index skidded 1.7% with South Korea, the Philippines, Indonesia and Taiwan all down. Even the Nikkei eased 0.3%, as rising yields offset the boost to exporters from a weaker yen. EMini futures for the S&P 500 also lost 0.4 percent in Asian trade, while European stocks opened down 0.6%. Emerging-market shares were hit particularly hard. The higher Treasury yields supported the greenback, and the Bloomberg Dollar Spot Index rose a sixth day. South Korea’s won was among the worst-performing currencies. Perhaps most notable among the EM sector, while China’s markets are shut, the offshore yuan slid past 6.9 per dollar in offshore trading. The dollar advanced for a sixth day, its longest streak of gains this year, supported by rising U.S. yields following the abovementioned hawkish comments from Powell as well as expectations for a strong employment report on Friday. The Bloomberg Dollar Spot Index extended gains but stayed below year-to-date highs amid sparse profit-taking. "This withdrawal of liquidity and gradual tightening of monetary policy" is reverberating across financial markets according to Bob Baur, chief global economist at Principal Global Investors "We look for 10-year Treasury yields to hit 3.5% at some point - later this year, early next year - and I think that’s going to be a real problem for stock markets." One exception to today's yield blow out, at least initially, was Italy where borrowing costs dropped for a second day, after the government said it would cut budget deficit targets from 2020 and reduce its debt over the next three years. Prime Minister Giuseppe Conte on Wednesday confirmed a deficit target of 2.4% of gross domestic product (GDP) in 2019 and said this would fall to 2.1% in 2020 and 1.8% in 2021. The estimates for 2020 and 2021 were lower than those initially reported, bringing further relief to bond markets rattled by the new government’s plans to ramp up spending. Italy's Deputy Economy Minister said the Government has set the 2019/20 GDP target at 1.6%. Italian Interior Minister Salvini then said that citizens income and pensions measures in budget are to cost €16bln and that they are not taking a step back on the deficit targets even if the German-Italian 10-year spread widens to 400BPS. Italian Industry Association has said they are "partially satisfied" with the new budget plan. However, after some initial short covering, yields on Italian 10Y also rose, and were at 3.360% last, up 5 bps on the day. Elsewhere, oil prices slipped from four-year highs, pressured by rising U.S. inventories and after sources said Russia and Saudi Arabia struck a private deal in September to raise crude output. Brent eased 0.1 percent to $86.20 a barrel on Thursday, while U.S. crude also fell 0.1 percent to $76.35 a barrel. Gold prices moved in a narrow range, last trading up 0.2 percent at $1.199.43 per ounce. Thursday economic data includes initial jobless claims and durable goods orders. Costco, Constellation Brands are due to report earnings. Asia-Pac stocks traded mostly lower as the effects of rising rates spooked investors following a concoction of strong US economic data and upbeat comments from Fed’s Powell. ASX 200 (+0.5%) bucked the trend as the index was supported by energy and financial names, while Nikkei 225 (-0.6%) eroded initial gains and fell in the red on currency effects. Elsewhere, Hang Seng (-1.7%) underperformed as the healthcare sector also weighed on the index, while mainland China was closed due to the Golden Week holiday. Finally, JGB yields rose across the curve with the 10yr and 30yr yields hitting levels last seen at the front end of 2016. US Vice President Pence is to say that US "will not be intimidated" by China following the dispute at the South China sea. According to the excerpts, Pence is also to say that China laid out a strategy in June to split US groups with "covert actors, front groups, and propaganda outlets". In related news, the US Navy is reportedly to propose a "major" show of force to warn China after the South China sea quarrel. European equities are once again on the back foot, as concerns about a more hawkish Fed and resurfaced worries about Italy’s budget plans have hit stocks. The negative risk tone has led all major European bourses into the red, with the FTSE lagging its peers due to additional pressure offered by a bid GBP. The financial sector is outperforming as European banks are benefitting from the yield environment in fixed income, with Deutsche Bank, SocGen and Credit Agricole all up over a percent. Danske Bank are close to the foot of the Stoxx 600 after reports the Danish bank have had to discontinue their share buyback programme amid dialogue with US authorities over their Estonian money laundering scandal. EasyJet are down around 1.1% following a 0.8% drop in their load factor compared to last September. In FX, the DXY saw some loss of momentum and a retracement from peaks, but the Greenback remains underpinned by elevated US Treasury yields and marked curve re-steepening in wake of Wednesday’s upbeat US macro releases and comments from Fed’s Powell acknowledging the latest ADP and services ISM survey strength. In fact, the FOMC head went as far as saying that rates may be hiked above neutral levels and expressed concern about the economy overheating, prompting further Dollar buying that pushed the DXY beyond 96.000 at best. GBP/JPY/CHF/EUR - All attempting to regain composure, or fight the Fed, as Cable rebounds above 1.2950, Usd/Jpy retreats from 114.50+ highs, the Franc retests support around 0.9900 and the single currency pares some losses within a 1.1465-1.1500 broad range. However, the bounces look shallow if not futile and more technical than sustainable or based on anything fundamental, at this stage, with Eur/Usd eyeing key Fib levels above and below (1.1497-22), and wary about mega option expiries running off on NFP Friday from 1.1450 to 1.1500 in 3.7 bn. EM - No shock to see the higher yield/beta/risk currencies suffer at the hands of widespread Usd demand, as Usd/Try rebounds further from recent sub-6.0000 lows, but the Cny and Cnh have pared some losses from the 6.9000+ area as Golden Week nears an end, perhaps conscious about intervention next Monday? In commodities, the oil market is hanging around 4 year highs, but is off best levels after Saudi Energy Minister confirmed the Middle-Eastern exporter has a spare capacity of 1.3mln BPD, whilst also saying that Saudi exports to the US are increasing markedly. The Energy Minister also said that they are to add and maintain another 1mln BPD of spare capacity by investing USD 20bln. Oil relevant news has come in the form of a preliminary estimate of a 8-11mln cubic meter discovery in the Norwegian sea. The gold market is recovering from the losses seen in the previous session (-USD 6/oz), with it currently testing USD 1200/OZ to the upside. This came after the DXY hit 6 week highs off the back of hawkish commentary from Fed Chair Powell. Aluminium has risen to its highest point in over 3 months and extending the gains driven by Norsk Hydro’s Brazilian site closure. Wednesday was the largest 10-year Treasury yield sell-off since November 2016 after the US election. We've felt for some time that the risks on yields and inflation are very asymmetric to the upside at the moment and yesterday the dam cracked a bit. Fuelled by bumper US ISM data – more on that below – 10-year Treasuries surged nearly 12bp higher to 3.183% last night and have since touched 3.198% overnight. We’ve now easily passed the previous YTD intraday high of 3.1261% made in May and are at the highest level since July 2011. This sets us up nicely for tomorrow’s average hourly earnings print. The yield move was an outsized response to the data. The September ADP employment print came in at 230k (vs. 184k expected) with gains fairly broad-based across industries and company size. Later on, the ISM nonmanufacturing also printed stronger than expected at 61.6 (vs. 58.0 expected). That was in fact the highest reading since August 1997 with the employment component also hitting the highest level on record. Prices paid rose to 64.2 and the highest in four months. The rest of the Treasury curve also sold off with 2y yields rising 6.1bps and 30yr yields rising 11.8bps to the highest since September 2014. 2yr and 5yr yields are now at decade long highs with 5yrs breaching 3% for the first time over that period. The bear-steeping did mean the 2-10s curve widened 5.7bps to 30.5bps and the highest since early August. Fed expectations also moved up on the positive data, with the market pricing an additional 7bps of hikes through end-2019, while the positive economic outlook from Fed policymakers didn’t hurt either. In a public Q&A, Fed Chair Powell confirmed his recent view in favour of continued gradual rate hikes, saying “we’re gradually moving to a place where they’ll be neutral […] we may go past neutral.” He sounded optimistic on the economy, citing increases in wages, tame inflation, and low unemployment. 2 of the 7bps of Fed funds repricing yesterday came after Powell’s comments and 2bps on Treasuries. So this wasn’t the big story. More Fed speak later. European bond yields rose 3 to 5bps across the continent, but they closed when 10-year Treasuries were only 5.2bps higher so there will very likely be some follow through today. Indeed, with the late US move the 10yr UST/ Bund spread (+272bps as of this morning) stretched to the highest level since Bloomberg starts their data series in 1989. I personally still think Bunds are one of the most mis-priced global asset classes. US large caps hardly budged as the Treasury market unravelled until a late session dip left the S&P 500 around a third of a percent off the highs closing +0.07% but with the DOW (+0.20%) notching another record high. Small caps finally decided to re-join the recent party though with the Russell 2000 (+0.92%) snapping two days of losses, with banks in particular outperforming thanks to the higher yields. The S&P 500 banks index gained +1.25%, while bondproxies retreated with utilities and consumer staples down -1.23% and -1.06% respectively. Europe was once again dictated by Italy, this time with the positive headlines outweighing the negatives, and so helping the STOXX 600 (+0.50%) and FTSE MIB (+0.84%) to gains also. Staying with Italy, the early rally in markets – which also helped 10y BTP yields to fall 17bps at the open – came following the various Italian press reports that we mentioned yesterday about the Italian government seemingly softening deficit targets beyond 2019. Deputy PM Di Maio confirmed the earlier press reports while Finance Minister Tria said at an event in Rome that the government was committed to “ensuring a constant reduction of the debt toward the objective agreed with the EU” and that “the government intends to follow an approach that combines fiscal responsibility and stimulus to economic growth, and we will ensure starting next year an acceleration of debt reduction”. Overall, the news flow was positive in that it signalled that the Italian government is responsive to market pressure and willing to change its course if necessary, and 2y and 10y yields ended 26.9bps and 13.9bps lower respectively. After the close we heard that the government will target deficits of 2.1% and 1.8% in 2020 and 2021, respectively, as well as reduce debt-to-GDP to 126.5% by 2021 (currently around 131%). The details remain key however, since if the smaller deficits are the result of more optimistic growth forecasts without associated spending cuts, the market is likely to view them as less credible. Partly helping the moves for Italian assets yesterday too were the remaining September PMIs in Italy. The services reading in particular came in stronger than expected at 53.3 (vs. 52.8 expected) which helped the composite to climb 0.7pts from August to 52.4. France’s services reading also surprised to the upside (54.8 vs. 54.3 expected) – another country where the growth momentum had been questioned of late. On the other side of that Germany was revised down just over half a point to 55.9 – albeit still at solid levels – while the broader euro area composite print was confirmed at 54.1 compared to the 54.2 flash reading. That reading is consistent with growth around +0.5% qoq. More unstable data came from the September CPI report in Turkey. The monthly reading came in at a much higher than expected 6.3% mom (vs. 3.4% expected) – beating even the highest estimate on Bloomberg by 2.2 percentage points. That in turn saw the annual rate climb from 17.9% to 24.5% and the highest since June 2003. The core reading also hit 24.1% while PPI printed at 46.2% yoy and is now the highest since 2001, or since Erdogan’s Party took power. Staggering numbers. The Turkish Lira pared heavier declines to close -1.01% weaker, a sign perhaps there is more confidence in Turkey’s central bank to react. In fairness, bonds were a lot weaker with local 10-year yields up 92bps to 18.37%. For context, our economists expect CPI to hit 27% yoy at the end of this year, so the worst is still to come. A quick check on Asia now where what stands out the most is the broadbased selloff across currencies in the region following the one-way move for the dollar in the last 24 hours. Currencies in South Korea (-0.83%), Thailand (-0.73%), Indonesia (-0.68%), India (-0.49%) and the Philippines (-0.37%) are amongst those to see heavy falls with just the Japanese Yen (+0.16%) posting gains. That hasn’t helped equity markets in the region with the Nikkei (-0.58%), Hang Seng (-1.68%) and Kospi (-1.48%) all sharply lower. Bourses in the likes of Thailand (-0.43%) and Indonesia (-1.61%) have also tumbled while US equity futures are down -0.40%. Meanwhile bond markets have followed Treasuries. Benchmark yields in Australia and New Zealand are +7.1bps and +4.0bps higher respectively however the relative big move has been for JGBs where 10y yields are +2.3bps higher at 0.151%, touching the highest since January 2016. So potentially on the verge of testing the BoJ’s new tolerance level for the upper limit of the band. One to certainly watch. Back to yesterday, where earlier in the day, two FOMC voting members offered contrasting views on the outlook for rate hikes. Philadelphia Fed President Harker said “I’d just like to slow the pace” of hikes, while Chicago Fed President Evans endorsed “policy to move gradually to a mildly, moderately restrictive stance.” Additionally, Cleveland Fed President Mester, one of the committee’s more hawkish members, also said it was appropriate to raise rates gradually. Fed Governor Brainard also spoke, but did not touch on the economic or policy outlook. Finally, over to the UK where Prime Minister Theresa May gave her speech to the Conservative Party conference. She mostly recommitted to her existing stance and maintained her Brexit plans, though she did not mention “Chequers” by name as a possible signal to her Brexiteer flank. She said the end of austerity is near and rejected a second Brexit referendum. The key challenge – finding an exit deal that is satisfactory to a majority of parliament – remains unchanged but it was a confident speech which reduces the risk of an imminent leadership battle. Before the day ahead, after the downgrade to General Electric’s credit rating, following its $23bn goodwill write-off on Monday, Luke Templeman on my team has created a model that assesses which US and European stocks are most susceptible to goodwill write-offs. Considering US and European companies now carry record levels of goodwill, investors should see GE’s write-off as a warning sign. Stock screens are available and click here for the full report. In terms of the day ahead, it’s a pretty quiet one for data releases. There’s nothing of note in Europe this morning while in the US this afternoon we’ll get the latest weekly initial jobless claims reading along with final August durable and capital goods orders revisions, and August factory orders data. Away from that we’ve got the ECB’s Hansson, Nouy and Nowotny all due to speak today along with the Fed’s Quarles in the afternoon. Italy’s Finance Minister Tria is due to speak again this morning while EU trade ministers are due to meet informally in Austria. All eyes on the bond moves however.